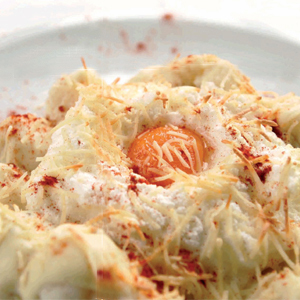 Recipe from the Los Cameros restaurant, El Rasillo de Cameros (La Rioja). Cook the cauliflower in boiling salted water until al dente. Meanwhile, prepare a béchamel sauce with the butter, flour and milk. When the sauce is ready, add the mustard and salt to taste, and cook over a low heat for 2 minutes. Remove from the heat and add half the grated cheese, stirring well until melted. Drain the cauliflower well, place in an oven-proof dish and pour over the béchamel sauce. Beat the egg whites until stiff, add a little salt and put the egg yolks on top. Sprinkle the remaining cheese over the top. Pre-heat the oven to 180 °C and bake the cauliflower until golden. Serve sprinkled with cayenne pepper to taste.